Super Smash Bros. Ultimate has received a brand new update that brings the game to version 2.0.0. A lot of rebalancing has been done in the game, as well as big fixes. However, the biggest addition of all is the arrival of Piranha Plant. 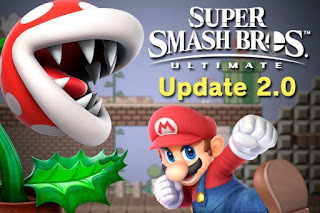 Although Piranha Plant isn’t available to purchase as DLC yet, those who have redeemed their Piranha Plant Smash Ultimate codes before January 31st will be able to play as the fighter now. The patch notes are below. Shortened the landing time after using the move. Extended the time from when the arrow is loosed to when it disappears. Extended the range of the missile and reduced the vulnerability when using the move in the air. Shortened the amount of time you cannot grab edges after using the move. Increased power range and attack power while maintaining launch distance. Slightly reduced vulnerability and extended undamaged launch distance. Adjusted the super armor frames after using the move. Opponents on the ground will no longer suffer a meteor effect. Increased attack power and maintained launch distance. Increased attack power of low-power zone. Shortened launch distance of repeated attacks. Crouching opponents will now be launched the same as standing opponents. Nana and Popo will follow each other more when separated. Made it easier to grab edges. Increased the first attack’s range. Shortened the downtime from shielding. This move will now always launch forward. Shortened the launch distance when the attack hits the middle of an opponent’s body. Shortened the amount of time undamaged opponents are buried. Increased attack power and extended launch distance. Reduced the attack range of the moving Gordo. Special moves will not be activated when jumping and using Mega Buster. Extended launch distance for Luma’s Up Tilt Attack. Extended the distance Luma moves forward. Shortened the amount of time you cannot grab edges after using the move. Increased the amount of time hit detection lasts. Shortened the amount of time between the start of the move and the meteor effect. Reduced vulnerability when sending out and calling back Luma. Shortened the distance you can shift when the attack is making contact. Shortened the landing time and the amount of time you cannot grab edges after using the move. Increased the range of the inner attacks. Can no longer move immediately when landing on a moving platform or slanted ground. Increased attack range and shortened the opponent’s hitstun shuffle distance. Extended the high-damage window and reduced the low-damage window. Reduced vulnerability when landing after using the move. Extended distance and increased speed. Greatly increased damage to opponents’ shields. Extended launch distance of kick performed with extra input. Extended the time until you disappear after landing the attack. Increased the speed of the backwards edge-grab range detection. Increased vulnerability. Shortened hitstun time for the exploding clay pigeons. Opponents hit in the air will be launched, making it easier to hit them with the next hit. Can no longer jump immediately after using the move. Increased the range of Finishing Touch at the beginning of the move. Shortened the amount of time undamaged opponents are buried. Moved attack range back while on the ground. Shortened the length of the vacuum effect. Reduced the range of the attack. Extended vertical and horizontal distance.